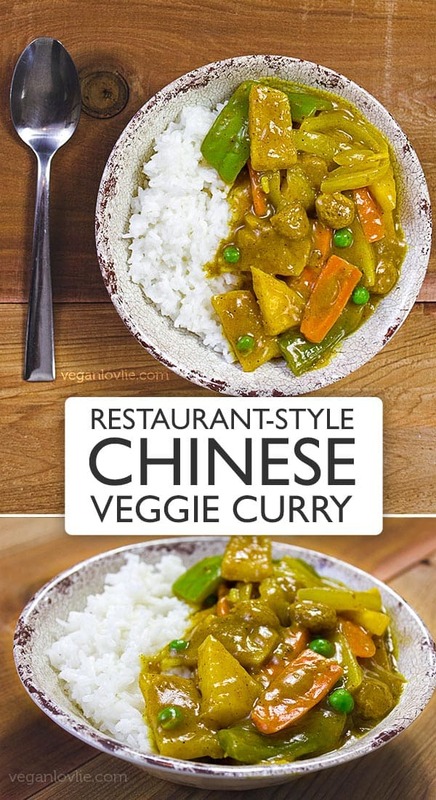 Chinese Vegetable Curry made stir-fry style with jicama and soya chunks (also known as Textured Vegetable Protein or TVP). The tropical fruit flavours from the ripe pineapple combined with soy sauce gives that umami flavour in the starchy curry sauce. It is quite reminiscent of fish sauce without the strong smell. Your taste buds will be singing! Jicama is probably best enjoyed raw with a little bit of salt and chili powder. Other than this, for its taste that is befittingly described as a savoury apple, you would tend to find jicama tossed in salads, prepared as fries or mixed in stir fries like my previous Chop Suey recipe. Less commonly used in curry recipes, this delightfully juicy, mildly sweet and nutty tuber does a wonder in a spiced sauce. Its flesh stays crisp and picks up the flavours nicely. If you can’t find jicama though, water chestnuts make a good substitute. It is rather strange that with such Chinese influence in the Mauritian cuisine, Chinese-style curries are not all that popular in the island. Kevin and I were only introduced to Chinese curries while living in the UK. In fact, Kevin grew really fond of these curries from a Chinese take-out he used to buy from in Dundee. 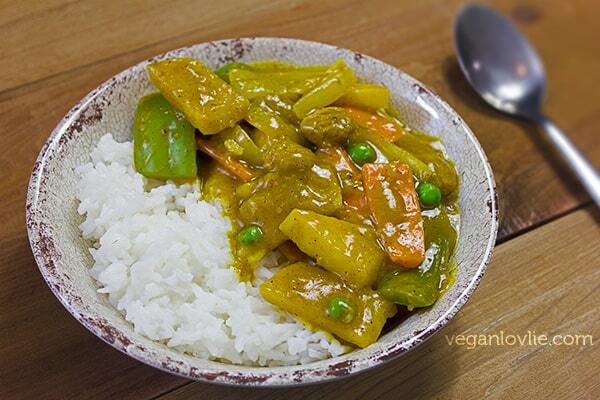 In an attempt to recreate the memory of these takeaway-style Chinese vegetable curries, Kevin came up with something pretty tasty with a good balance of flavours and textures. 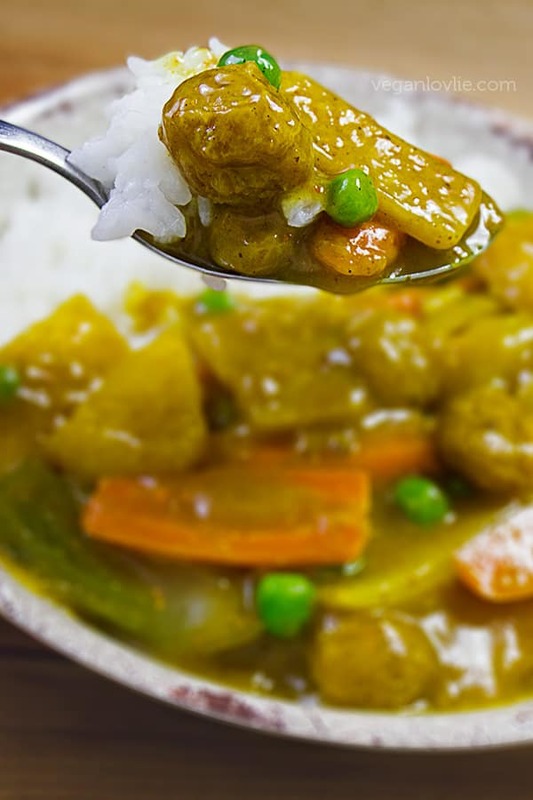 The characteristic of this Chinese vegetable curry is the starchy gravy base that is thickened with cornstarch or potato starch. The addition of soy sauce, jicama and bell peppers creates a medley of textures as the flavours mingle in a gooey curry sauce to produce a unique combination. The tropical fruit flavours from the ripe pineapple combined with soy sauce gives that umami flavour that will make your taste buds sing; it is quite reminiscent of fish sauce without the strong smell. 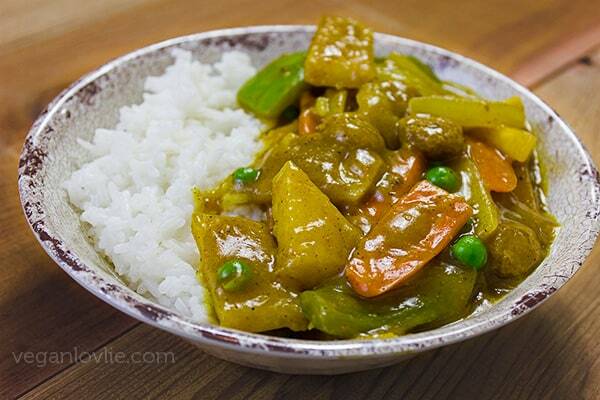 Watch Kevin as he demonstrates how to prepare the vegetables and make this delicious Chinese Vegetable Curry. Peel the jicama by inserting the knife under the skin and pulling it off. It should come off fairly easily. (Watch the video to see how to do this). Once peeled, cut the jicama into 5-cm (2-inch) batons, then cut each baton across to make slices of about 5 mm thick. Cut the bell pepper into large julienne of about 5 cm (2 inches) in length. Cut the carrots across into 2-inch length then make slices of about 5 mm thick. If using fresh pineapple, you can peel and cut it into segments (like in these instructions). Then cut the segment across to make triangular slices. Or just cut into chunks. Slice the onion into medium-sized wedges. Immerse the soya chunks in some water in a small saucepan. Cover and bring to a gentle boil over medium temperature until soya chunks are soft (about 8 – 10 minutes). Then drain and keep aside. While soya chunks is boiling, you can saute the vegetables. In a wok on medium-high temperature, add one tablespoon of coconut oil. Add the carrots followed by the jicama. Add a pinch of salt and saute for a few minutes. Add a little soy sauce or tamari then add the green bell peppers. Continue to stir fry for about 30 seconds then add the pineapple pieces followed by the onions. Stir and toss for a another minute or two. Add a little more soy sauce. Don’t overcook the vegetables as they will continue to cook later in the sauce. You may add a little bit of black pepper to taste. 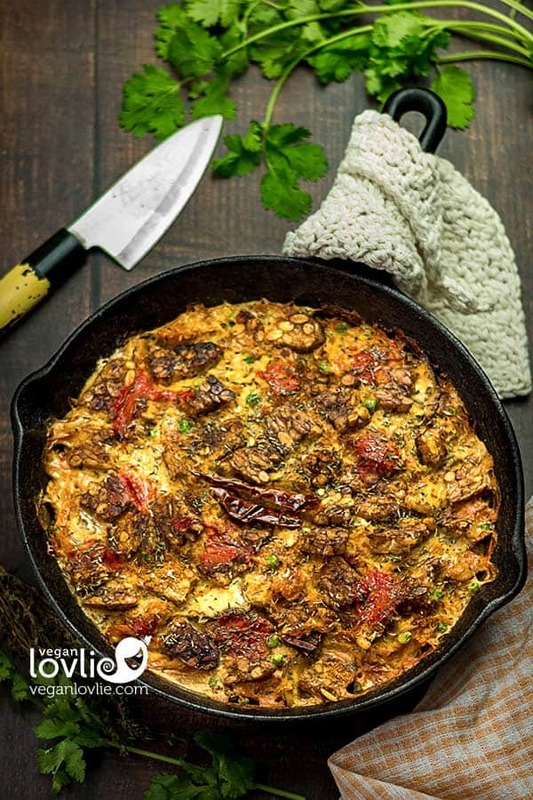 Stir and remove the vegetables from the pan and set aside on a plate. Now saute the soya chunks. You can saute in the same wok or use a cast iron pan for this as it gives the soya chunks a distinct flavour that the non-stick wok doesn’t. So, heat one tablespoon of coconut oil on medium-high temperature. Add one tablespoon of minced ginger (or ginger-garlic paste). Let this sizzle for about 10 seconds then add in the soya chunks. Add the cumin powder. Stir fry for about 2 minutes then add about 1 tablespoon soy sauce and continue to saute for a few minutes. Stir fry until soya chunks pick up a slightly crispy layer. Remove from the pan and set aside on the same plate as the vegetables. Make the sauce in the same wok that we stir fried the vegetables. 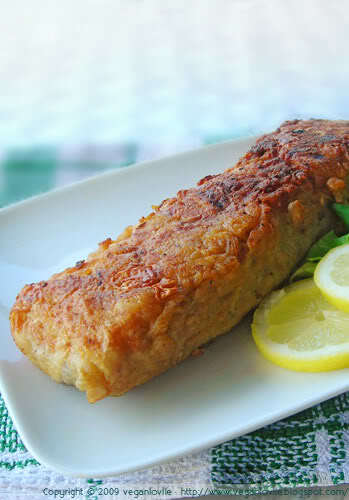 Heat one tablespoons of coconut or vegetable oil on medium temperature. Add one tablespoon of minced ginger (or ginger-garlic paste). Add the curry powder. Stir and roast for about 30 seconds then add about 1/2 cup of water. Stir and mix properly. Let the sauce cook for about 1 – 2 minutes while stirring. Add in the pre-cooked vegetables and soya chunks. Stir and mix the vegetables with the sauce. Add about 1/4 cup of water. Dilute the cornstarch in about 3/4 cup of water. Add this mixture to the vegetables and stir immediately as the sauce will thicken pretty quickly. Add a little bit more water if required to adjust the consistency of the sauce. Add a little more soy sauce to taste. Lastly add the defrosted frozen peas and salt if needed. Stir and cook for 3 more minutes then turn off the heat. 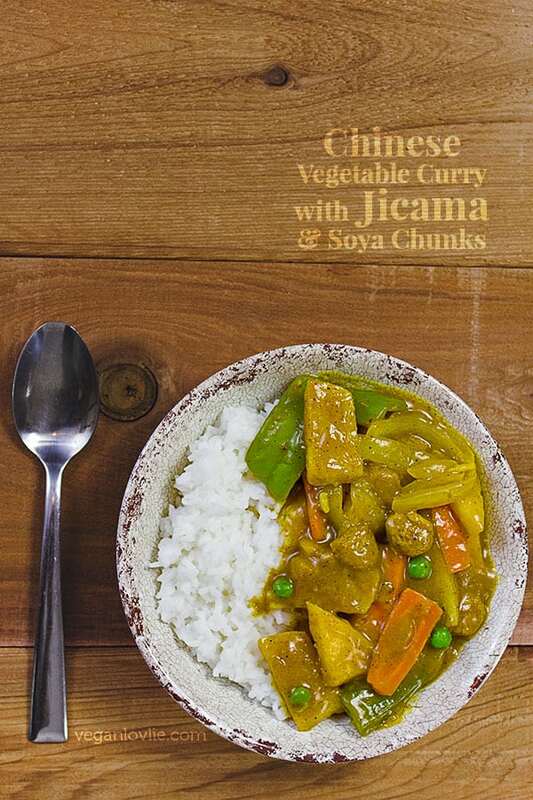 A delicious Chinese vegetable curry made with jicama and soya chunks (also known as Textured Vegetable Protein or TVP). The tropical fruit flavours from the ripe pineapple combined with soy sauce gives that umami flavour in the starchy gooey curry sauce. It is quite reminiscent of fish sauce without the strong smell. Your taste buds will be singing! If using fresh pineapple, you can peel and cut it into segments. Then cut the segment across to make triangular slices. Or just cut into chunks. Immerse the soya chunks in some water in a small saucepan. Cover and bring to a gentle boil over medium temperature until soya chunks are soft (about 8 - 10 minutes). Then drain and keep aside. In a wok on medium-high temperature, add one tablespoon of coconut oil. Add the carrots followed by the jicama. Add a pinch of salt and saute for a few minutes. Add a little soy sauce or tamari then add the green bell peppers. Continue to stir fry for about 30 seconds then add the pineapple pieces followed by the onions. Stir and toss for a another minute or two. Add a little more soy sauce. Don't overcook the vegetables as they will continue to cook later in the sauce. Now saute the soya chunks. You can saute in the same wok or use a cast iron pan for this as it gives the soya chunks a distinct flavour that the non-stick wok doesn't. So, heat one tablespoon of coconut oil on medium-high temperature. Add one tablespoon of minced ginger (or ginger-garlic paste). Let this sizzle for about 10 seconds then add in the soya chunks. Add the cumin powder. Stir fry for about 2 minutes then add about 1 tablespoon soy sauce and continue to saute for a few minutes. Stir fry until soya chunks pick up a slightly crispy layer. 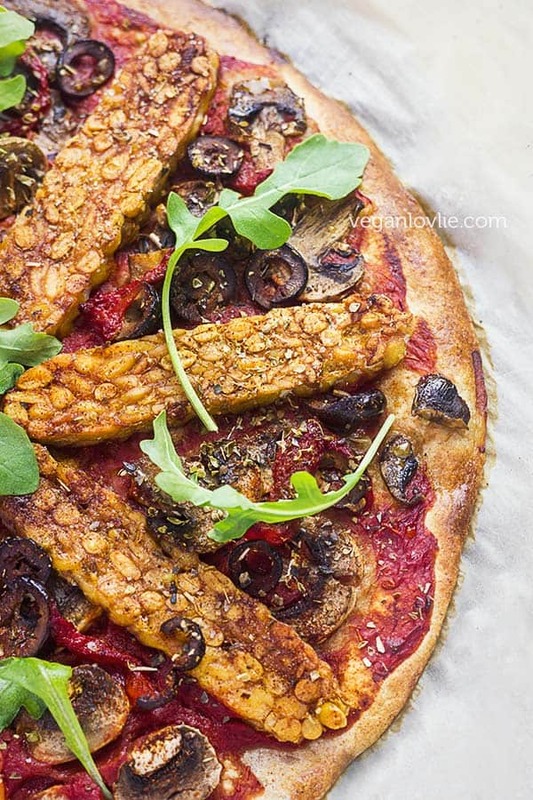 Remove from the pan and set aside on the same plate as the vegetables. Make the sauce in the same wok that we stir fried the vegetables. Heat one tablespoons of coconut or vegetable oil on medium temperature. Add one tablespoon of minced ginger (or ginger-garlic paste). Add the curry powder. Stir and roast for about 30 seconds then add about 1/2 cup of water. Stir and mix properly. Let the sauce cook for about 1 - 2 minutes while stirring. Add in the pre-cooked vegetables and soya chunks. Stir and mix the vegetables with the sauce. Add about 1/4 cup of water. On an end note, for a wonderful year of the Monkey, a very Happy Chinese New Year 2016 to everyone celebrating!